Pigeons from the study in flight. Credit: Zsuzsa Akos, Eotvos University, Budapest. Travelling in flocks may make individual birds feel secure but it raises the question of who decides which route the group should take. Mathematical models developed by scientists suggest that a simple set of rules can help flocks, swarms, and herds reach a collective decision about where to go. But investigating how this really works, especially with animal groups in flight, is extremely challenging. A new study led by Oxford University scientists, reported in the Journal of the Royal Society Interface, has used the sort of high-resolution GPS technology normally reserved for extreme sports to look at how homing pigeons make decisions on the wing. OxSciBlog: What are the advantages of flying in a flock? Benjamin Pettit: For pigeons, the main advantage of flying in a flock is to lower the risk of being eaten. Therefore pigeons in flocks need to coordinate their behaviour to stay together - something they have in common with many other animals. In addition to safety, there might be navigational advantages to flying as a flock. For example, when a flock of pigeons flies home together, the route they take will potentially combine navigational knowledge of many birds. OSB: How are pigeons able to 'share information' in flight? 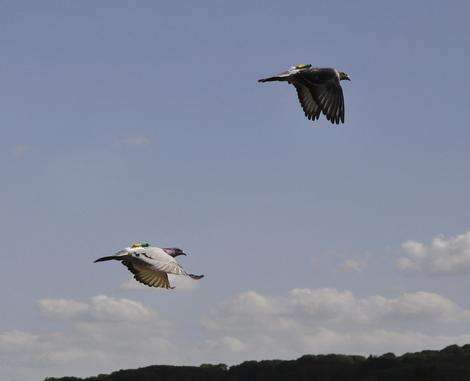 If each bird is also paying attention to navigational cues, like familiar landmarks, then flocking rules will be effective at sharing information within the flock. What we do know from previous data on pigeon flocks is that there isn't always an equal, two-way exchange of information, and instead some pigeons have more of a leadership role within the flock. OSB: How did you explore group navigation behaviour? BP: We studied the simplest flocking scenario of two pigeons flying home together. Each pigeon had its own preferred homing route, which meant we could test how each pigeon's preference factored into the pair's route, and also find out how the group decision arises from the pigeons' momentary interactions during the flight. The pigeons carried lightweight, high-resolution GPS loggers, which were actually designed for extreme sports. It was also the right technology for racing pigeons. Working together with mathematical biologists at Uppsala University in Sweden, we created a simulation based on the interaction rules that we inferred from the GPS data, which was a useful tool for studying pigeons' group decisions. OSB: What did you find out about the rules governing this behaviour? BP: Pigeons responded to each other by adjusting their speeds and making small turns, maintaining a close, side-by-side configuration most of the time. A pigeon was sensitive not only to its neighbour's position, as has been observed in fish schools, but also to the direction its neighbour was headed. The flocking behaviour was stronger toward a neighbour in front than behind, which means that a faster pigeon that consistently gets in front has more influence over the pair's route. This simple leadership mechanism based on speed is something we investigated with a combination of the data and the simulation. Our findings show how real bird flocks compare to the 'rules of motion' postulated in simulations over the past three decades. OSB: How might your findings help us understand group navigation in other animals? BP: First of all, we found that persistent leadership-follower relationships observed in nature are not necessarily something complicated that requires animals to recognise each other and assess each other's ability. The mechanism can be as simple as a difference in speed. Second, we found some similarities with fish in terms of how flocks/schools are formed, but also some differences that are likely due to the biomechanics of flight versus swimming. The pairwise configuration of pigeons is similar to that observed in starling flocks. Rather than converging on a 'universal' flocking rule, different animal lineages have their own solutions for collective motion, which affect the shapes of schools, herds, and flocks. The particular interaction rules will also affect how information passes through these groups from one animal to another. A report of the research, entitled 'Interaction rules underlying group decisions in homing pigeons', is published in the Journal of the Royal Society Interface.